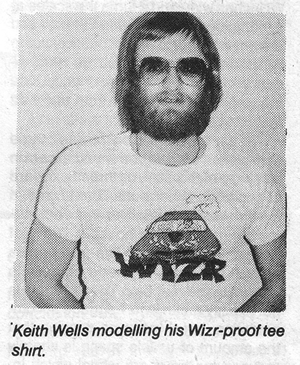 This blog is dedicated to Keith Wells, the late Peter McMahon and their creation: Wizr - Kuwait's greatest driver. Keith Wells worked at the Arab Times in Kuwait sometime during the late 70s, early 80s. His articles about life in Kuwait have been compiled in a number of books, that are very hard to come by. As there is almost no information on WIZR on the net, this blog will endeavour to be a reference point for all WIZR fans still out there. I created this website to honor and document a piece of Kuwait’s modern history. I came across the Last Wizr book in the 90s, and even with the dawn of the age of the internet I struggled to find anything out about the author, Keith Wells, the illustrator, McPeter McMahon or anything related to the creation of WIZR. Over the almost 10 years this blog has been up, I have “met” many friendly people from around the world who shared books, stories, pictures and information. Through the help of complete strangers, I managed to acquire original copies of all three WIZR books. “In 1979 I'd been working in Kuwait as an English teacher for a couple of years in which I got to know quite a few different kinds of people and the general lifestyle of expatriates in Kuwait. The one thing that everyone seemed to have in common, regardless of age, occupation or background was a fear of driving...the accident rate was frighteningly high.. I suppose the arrival of super fast roads and expensive cars meant that unsophisticated drivers had very few limits. Many things I saw were quite horrific. A brand new Mercedes cut in half on the Airport Road. I can only imagine what sort of speed it takes to do that! Wizr just seemed to be a perfect way of dissipating the tension and fear that the traffic caused. 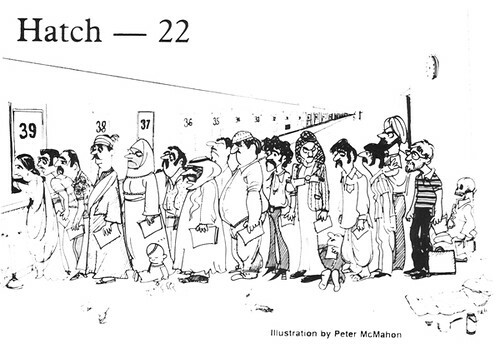 After a couple of the stories appeared and proved instantly popular, I met Peter McMahon at a party. Rather oddly, he had never read any of the Wizr stories, but somebody introduced him to me as a potential cartoonist. "So who is this Wizr character?" he asked. "He's the young Kuwaiti with a brand new Transam with the eagle stencilled on the bonnet." Peter nodded, pulled out a scrap of paper and scribbled away for a few minutes then held up a perfect cartoon of Wizr leaning back on his Transam with the eagle neatly transformed into a sort of demented chicken. Brilliant. We became friends from that moment on. Every week I would take the latest story around to his flat on Friday afternoon and collect his cartoon of the previous week's tale. He had an uncanny ability to visualise exactly how I imagined the story. It really was a partnership... some of his pictures have a life of their own beyond the stories. His drawing of Dozy Salaam with his twin rubber stamps, "Perhaps" and "Perhaps Not" is a real classic. The line of people waiting in the Traffic department ending with a skeleton sat against the wall. We each made the other laugh, one of the most wonderful gifts in my life. In the big scheme of things I'd like to think that we kept a few people sane in those years. There was a lot happening, the Iran Iraq war was audible even over the traffic noise during the day, a continuing rumble of cannon fire. Laughter is the best defence against despair, it defuses anger and neutralises fear. After six months or so I was contacted by Tony Jashanmal of the department store on Fahad Salem Street, and Bashir Qatib of the Kuwait Bookshop who were prepared to help finance a book of the stories. Peter and I jumped at the chance. He came up with the two cover pictures and a bunch of thumbnail sketches which I used to design and layout the book which was printed at the Arab Times. We launched the first book at the British Embassy Garden Fete in November 1979 and were amazed when we sold 480 copies in two hours! Mr. Wells has also been featured on another blog, and his interview can be read here. If you have any additional information or personal stories related to WIZR, please share them either by posting a comment in the appropriate section, or by emailing me at bigis03@hotmail.com. Keith Wells studied English at the University of Kent at Canterbury and Washington University. He spent a year in Jeddah before coming to Kuwait in January 1977. He worked at the Arab Times from 1979 to 1983 and was founder Editor of the Arab Times Supplement. After leaving the magazien he edited and presented a weekly television magazine called "Take Two." From 1983 to 1985 he was the Editor of both the Kuwaiti Digest and the Newsletter of Dar Al Athar. He is the author of the popular Wirz book, three volumes of light-hearted stories about Kuwait. With Dr David Clayton he has recently written a book called "Discovering Kuwait's Wildlife." He is currently (in 1987) working as a teacher in the English Department at Kuwait University. If you have any additional information on Keith Wells, please share it in the comments section, or send it by e-mail to bigis03@hotmail.com. When the Devil comes down to earth and doesn't want anyone to recognise him, he usually disguises himself as a dentist. With great daring and skill I managed to avoid three six-monthly check-ups in a row, but last week I realised the jig was up, it was time to get my teeth fixed. But as soon as I walked into reception I knew I'd been hasty. The nurse was the type of hatchet-faced harpy who stood grim and gaunt at Torquemada's side when that gentleman used heretics to illuminate Toledo ...son et lumiere with a vengeance. Nurse Jones would frighten Lady MacBeth. I gave her my appointment card. `Extraction?' she snapped, displaying an awesome set of stainless steel teeth. `No, no, of course not, just a checkup,' I simpered. 'Probable extraction,' she murmured with a loathsome steel smile. Dentist's waiting rooms are like anterooms to Hell, places where you have time to ponder all your sins and imagine their punishments. They always have plenty of magazines but of a particularly unsoothing kind. Speaking personally, I find small solace in knitting patterns while waiting to enter the jaws of hell. There were only two victims ahead of me, a child and an old man. The boy was about ten years old, defiantly sucking a sweet made from a chunk of sugared rainbow. I admired his spirit, I mean, sucking a sweet at the dentist's is like opening a Can-Can Night Club in Teheran: When the dread door opened he swaggered in like one unafraid of cavities, extractions and drills. But when he emerged twenty minutes later his face bore the look of one who's seen and felt THE HORROR. The nurse barely gave him a second glance before snapping 'Next "
The old man gave me a pate smile, winced at a lifetime of dental memories and staggered into the surgery. I sat waiting and sweating for half an hour, but when the door finally opened and Jaws herself came and snarled 'Next!' there was no sign of the old man. Had they drilled him into oblivion? Extracted him completely? Was there another exit, was that a direct route to the morgue? I stepped into the surgery and greeted the dentist warmly. He looked more like the sort of chap who'd fix main battle tanks, but I laughed politely, nice fellow, Morris. I gave him my most ingratiating smile to show him I'd brushed my mandibles specially ...but he was unmoved. I lay down on that strange Iron Maiden they call a dental chair and Morris jacked me up until I was in range of his heavy engineering. As his face loomed over me I noticed his eyes, blue as ice, fixed on my teeth and glittering, glittering. He shoved a triangular piece of rubber into my mouth that tasted as if it had been cut from the old bath plug. From the very bottom of my eyeball I saw his hand travel to his tray of weapons. He picked up the mirror. Relief! He can't hurt me with that. Then he picked up the spike hat goes with it. It didn't sound too good, so I tried a courageous smile, a mistake with a triangular bath plug, a mirror, spike and two hairy fists inside one's mouth. I nearly choked and Morris squinted in disapproval. He put the mirror aside, reached for a chrome-plated crowbar and went round my teeth like 'a railway man knocking the wheels of a train with a sledgehammer. I did so, smiled with stretched lips and got up to leave. But the nurse yanked me back. He rammed the chrome crowbar up against a molar that had PAIN written right through it like a stick of rock. The needle in question was about a foot and a half long, filled with pink liquid, and looked as though it were usually used for rhinocerii. As he pushed it into my mouth I avoided it frantically with my tongue, but my gums couldn't duck or dodge. The pain soon changed to that numb feeling as my whole mouth froze. I was dead from nose to chin. 'Open wider,' purred the dentist, jamming bales of wool, rubber plugs and bits of wrought iron in my mouth. Then he picked up a wrench and I looked desperately at the ceiling. I felt a sudden jolt in my jaw, then a clatter of steel as he dropped the wrench into an enamel tray. 'Now the little fillings,' he murmured. Easy, I thought, nothing to this, one out and I hardly felt a thing! But my relief was shattered by the drill. It was old, slow, blunt and plugged directly into a nerve that traveled three short inches from upper jaw to central brain and bellowed one clear message.OUCH!`Argle' I said, by way of explanation, remonstrance and plea for mercy. The Nurse said nothing, but her stainless steel teeth shone like a row of bayonets. 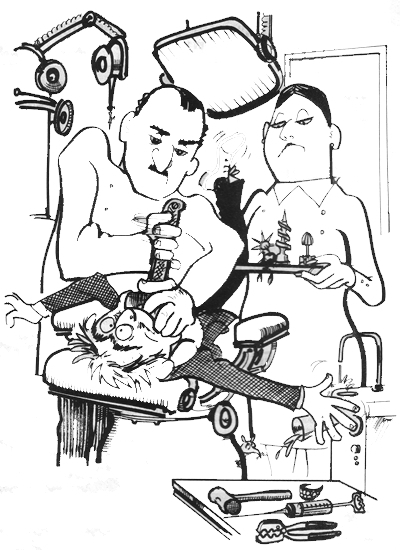 The dentist's eyeballs skittered around his skull like nervous snooker balls. He returned to the attack, wielding his drill like a miner at the coalface. But the nurse held my head as if in a vice and short of punching the dentist in his private practice, with the risk he'd drill a hole through my tongue by mistake, all I could do was submit. The drill make a sound like a buzz saw searing through a block of solid glass. At last it stopped and while he reached for some filling I explored the hole with my tongue. It felt large enough to park a bus. He packed it deftly with metallic junk, smoothed it off with a small grindstone, took out the rubberware, told me to rinse out then wandered off to play with his instruments; tonguescrews, gumspikes and the like. 'Cad I go dow?' I asked through lips as numb as welly boots. So I fled, taking my mouth with me. MY CAR registration ran out last week and I went to the Traffic Department to renew it. I waited patiently in line at Window No. 1 and, when I got to the front, pushed my papers through the hatch. "Window 27," said a voice from inside. Delighted to have so easily discovered the right place to go, I hitch-hiked over to Window 27. There were only a few dozen people waiting, and in less than three brief hours I was at the hatch. I offered my documents to the faceless Gods within. Now I'm a patient man, holder of the Amid Hospital Medal for X-ray Waiting, Winner of the 1977 Traffic Jam Award and a leading contender for the 1979 Post Office Patience Diploma. I'm skilled in the art of smiling through gritted teeth, of saying 'thank you' instead of spitting, and politely sipping tea when I'd rather be committing murder, so I calmly walked the few hundred yards to Window 13. There I joined a crowd of jolly folk all beating merrily on the hatch which was closed. In less than half an hour, Windows 12 and 14 opened to left and right of us. We broke into two groups and I rushed, or was rushed to the very front of Window 12. Again I thrust may papers into the maw of the beast. "Window 13," came the stem reply. I'm ashamed, yes, bitterly ashamed to confess it, I, Keith Wells, Holder of the All-Time Record of Visa and Fingerprint Delay, should have lost control over such a trivial matter, a mere 3-hour wait. But lose it I did, and I impatiently moved my head through the hatch and looked right, towards Window 13. And there, sitting behind the closed hatch talking affably on the telephone was Dozi Salaam, Kuwait's finest bureaucrat. "Dozi!" I cried. "Come back tomorrow," he replied warmly. You take a large wall and make 40 hatch windows in it, all numbered (preferably in the language of the Aleutian Islanders). The windows must be small and set low enough to rupture anyone who bends down to look through them. Then close all the hatches. Periodically open a hatch at random. When a queue had formed, slowly give each player a different hatch number to visit. The hatch may be open or closed. If closed, he must return to the hatch he has just visited, which with any luck, should now be closed, which means he's out. If the hatch he's sent to is open, however, the player waits his turn and is then given a new hatch number to visit. The trick of course, is that although there may be hundreds of players queuing outside, behind the hatches there is only one. Dozi Salaam, single-handedly pits his wits against the multitude to see if he can achieve the incredible aim of frustrating all of them. As an old friend, Dozi let me in behind the hatches and I watched him play. First he opened Hatch 39. Instantly a writhing mess of fingers appeared, squirming impatiently. Dozi calmly said: "Window 7. Window 7. Window 7," about 12 times then slammed the hatch shut.We listened to the thunder of feet receding down towards position seven, then Dozi calmly re-opened hatch 39 and gave one astounded contestant his registration papers all completed in about ten seconds flat. "There must always be a winner on the outside," Dozi explained, "or else they get disheartened and give up." Then he shut No. 39 and sauntereddown to open hatch 22. "But you told them Window 7," I reminded him politely. "Hatch 22, Always keep them guessing!" He opened the window and yelled, "All registration papers here, two dinars!" It was an astonishing sight. A blizzard of dinars poured through the hatch in the three-and-a-half minutes before Dozi slammed i4 shut. "Now, here comes the tricky part - issuing the registration books." He showed me a pile of them down by Window 5." You go over to Window 38 and create a diversion," he said, "I'll issue these." I suppose it's because I'm inexperienced, but when I opened Window 38 and three fat Egyptians started scrambling through the hatch simultaneously I panicked. But not Dozi, he picked up a fire extinguisher and affably extinguished them. Then, quick as a flash, he was back at window 15, hurling blueregistration books through the hatch, his rubber stamp a blur of speed. He worked like a Trojan for over fifty seconds before slamming the window shut and collapsing on to the sofa for a cup of tea and a chance to read his newspaper. After a bit, he looked up and noticed the time. "By heavens, it's late. Time for the Grande Finale." To my surprise, he dragged out a box of tape recorders and went along placing one behind every hatch. When they were all plugged in, he moved to a large console I hadn't noticed before. "Watch this!" he whispered, "It's sensational!" He pressed a button and all the windows opened at once. There was a dull muttering roar from our opponents and I braced myself, expecting instant and immediate invasion, but before the startled crowd could move, Dozi pressed another button and all the tape recorders spoke at once. "Come back tomorrow! "And all the hatches slammed shut. You need lots of it. If you can learn to hibernate while standing up in a Post Office queue you are well on the way to success. Never lose your temper, you'll never find it again in Kuwait. Birth, Marriage and Death Certificates are essential for all major transactions. If you intend to die you will need six photographs, signed on the back, and triplicate copies of your Birth Certificate to prove you are alive prior to dying. Persons dying without Birth Certificate will face severe penalties. In the event of sickness you are entitled to take time off work, however, you must present written proof of your illness to your employer. He will also require a Birth Certificate and a valid Residency Visa. Employees without such a visa will be considered fit for work, and deported. These are necessary for all official transactions, at least 100should be carried at all times. These must be handed over at once to the proper authorities, i.e. farashes, tea-boys and the gentleman gardening his nostrils who will be found in almost every office. Occasionally delays are unavoidable when dealing with any bureaucracy and you are advised to prepare yourself accordingly; a newspaper, sleeping bag and small primus stove are essential. This means influence. If your brother's friend's nephew knows the cousin of the official you are dealing with, your problems are over. If not, you should beat your brother and tell him to try harder. This is an Arabic word that means disaster. If you are sentenced to `boukra' it means that your papers are incomplete, not ready, or propping up the leg of an official's desk. Take your defeat gracefully, a polite cringe may work wonders. Do not worry, when you return nothing will have changed in your absence. All documents are good. The more you have the easier it is to get more. If you have your grandfather's Discharge Papers from World War One it is relatively simple to open a bank account, providing you can also show valid proof of your own existence (see above) and sanity. In the event of losing your sanity you will need the customary sixteen: photographs and a certificate from the doctor (together with a photocopy of the doctor's Birth Certificate) stating that your are without your senses. Kuwait - a personal view is a book of photographs taken by Claudia Farkas. Keith Wells wrote a 10 page introduction to the book with some background on Kuwait's history, culture, and Kuwaiti life in general. As the book was printed in 1987, the photographs are obviously dated, yet most things pictured are still around today and look familiar, with some wonderful images of Kuwaitis themselves, something quite rare in other photograph books. The trap is sprung. Your doom is sealed, you've stepped off the straight and narrow into a maze of impossibilities. These deadly maps come in all shapes and seizes, but perhaps the deadliest of all are the ones drawn on special paper that dissolves as soon as it comes in contact with ordinary air. There you are, dressed to the very molars, toes twitching at the thought of a good rave-up and all of a sudden you can't find the bloody map. There are only two solutions. Drive around the general party zone for a couple of hours effing and blinding your wife, or forget the driving and eff and blind your wife before she gets a chance to eff and blind you. But there are other maps just as bad, like the ones full of reference points like ‘block of flats’ when you find yourself in a forest of flats, or to obscure landmarks like ‘where the fire station used to be,’ which proves to be a fire station that existed before the oldest inhabitant was even conceived. The maps I have come to dread most are the ones which look plain and straightforward and lead you unerringly to a piece of waste ground where you're more likely to find a lunar module than a party. Take last weekend for instance. My wife had met these ‘lovely people’, Fred and Nellie, who invited us to a party. God rot their cocktails! Of course, the sly swine had given us a map which seemed perfectly simple so the wife and I polished our kneecaps, shampooed our eyebrows and generally beautified the areas in between, got in the car and set off for Fred and Nellie's hoe-down. 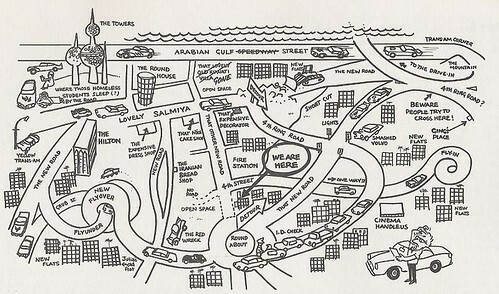 It was when the map appeared to place the Hilton Hotel in Salmiah High Street that I began to suspect there was a plot. But I held my peace and followed my wife's directions in good faith until she announced proudly, ‘This must be it,’ and I looked round to find ourselves in the car park of Qadsieh Football Stadium. She handed it over and I saw at once we were in for trouble. For a start, if you held the map one way up the party seemed to be in the general area of the Sheraton, but the other way up it was nearer Fahaheel. Held on one side it mysteriously moved towards Jahra and from the fourth point of view was either underneath the Kuwait Towers or a few miles past Ras Salmiah, heading out to sea. ‘Look, there's Salmiyah Roundhouse!’ my wife said, and sure enough it was clearly marked, right next to a Sea Club and the university campus out at Shuweik. ‘Did these bastards give you any clues?’ I asked, beginning to smoulder at the thought of imitating the Flying Dutchman. Not a word passed her lips, but I could see the sparks flying between her ears, so I drove out of the football stadium and headed back towards Salmiyah. Somewhere in the Palestinian Labyrinths my wife broke the chilly silence to offer the information that the aforesaid sweet and lovelies had mentioned that they were on the top floor and you couldn't miss it because the block was exactly the same as the one next door. At the time we were driving through what is best described as Lower Salmiyah where all the blocks are exactly the same as the one next door, but I gritted, (or is it grat?) my teeth and kept going. Indeed, the map had mosques, like kids have measles, so I turned left and sure enough there were two identical buildings side by side. Personally I didn't care if it had burned down, but I dutifully parked the car and we went up to the top floor, and rang the bell. 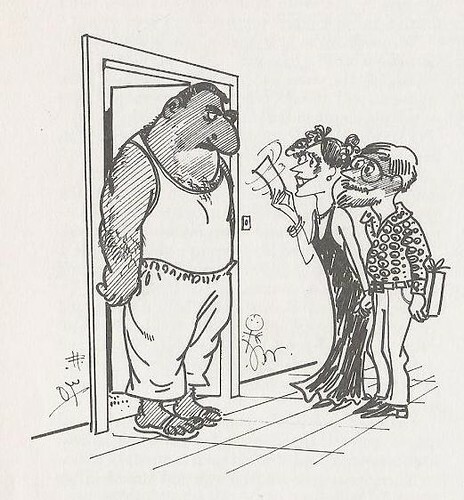 An Armenian prizefighter opened the door and when I politely enquired, “Nellie?” he grunted like a Neanderthal with piles. ‘Must be next door.’ muttered the wife, waving the map at the Armenian. ‘Do Fred and Nellie run an orphanage?’ I enquired quietly, treading on one particularly insistent brat who kept dribbling on my socks. ‘Sorry, wrong house!’ my wife told Mrs Abdullah Hubbard and Sons and we fled back to the car. Well, we tried. Believe me, we drove from one end of Kuwait to the other to find Fred and Nellie's den. At one point I thought we might be lucky but the map led us directly to a disused bulldozer beside a six foot deep trench. I know it was six foot deep because I fell in it. By that time the only party I wanted to attend was a lynching party starring Fred and Nellie. I scrabbled out of the ditch, heroically resisting the temptation to kick the wife in, briefly considered hijacking the bulldozer and razing Fred and Nellie's building to the ground, but abandoned the idea as impractical since I couldn't find it. We got back in the car, made a swift tour of the shanty town beyond the airport before packing it in. Of course, my wife made a hell of a fuss when I ran him over, but the judge agreed it was justifiable homicide. visitors since May 22, 2006.